Spirit Realty Capital (SRC) is a triple net lease REIT focused on single tenant commercial real estate, SRC effectively makes middle market loans secured by real estate collateral. The REIT is very similar to STORE Capital (STOR) which did a private placement with Berkshire Hathaway last year, the difference being Spirit has a high concentration to one troubled retailer, Shopko, that is creating an unwarranted discount in the shares. REITs generally need their shares to trade at a premium to NAV in order to play the private/public valuation arbitrage game and grow, when a REIT trades a significant discount like Spirit does, it gets stuck and is forced to come up with a strategy to continue on a growth path. Spirit was a net seller of assets in 2017, but it has come up with an interesting solution to fix their discount, in the second quarter they will be spinning off their Shopko assets along with the assets and debt related to one of their asset backed securitization vehicles called Master Trust 2014. 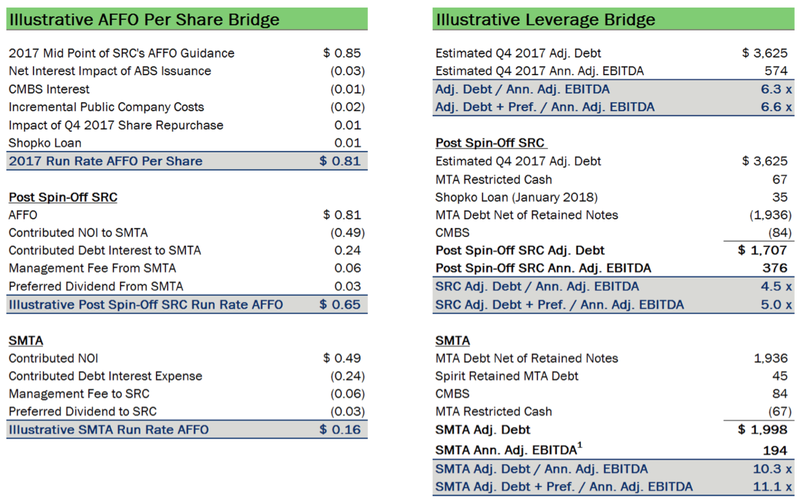 The spinoff will be named Spirit MTA REIT (SMTA) and is generally viewed as a garbage barge spinoff that's worthless, while it's likely to trade ugly initially, there's call option like value in the spin while more importantly allowing the parent company to shed its riskiest asset. After the spinoff, Spirit should trade more inline with its net lease peers. Most REITs are going to look cheap compared to Realty Income Corp, but after the spinoff new SRC should look a lot like STORE Capital and that large discount between the two should close over time. Shopko is a mostly rural (midwest and western US) discount store that's facing similar pressures to many retailers, its under-invested in its stores and sells ubiquitous products that you can buy almost anywhere. It's target market is similar to Sears, its sort of an unfocused general store. Spirit currently leases 101 properties to Shopko, representing 7.8% of its lease roll (prior to the spinoff), it recently became a secured lender of Shopko as well, advancing $35MM in the form of a term loan at a 12% interest rate. The term loan will provide SRC/SMTA with quarterly financial statements and more direct insight into how the business is performing and also gives them optionality to separate the Shopko assets further if necessary. SRC has been selling down Shopko assets in recent quarters/years, and will continue to do so at SMTA with the goal to completely dispose of the assets within 24 months of the spinoff. With the proceeds from the dispositions, SMTA will contribute those proceeds to the Master Trust and lever it up. 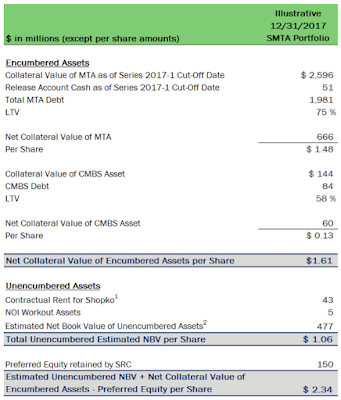 The Shopko portfolio is debt free today, so in the event of a bankruptcy/liquidation at Shopko, the remaining assets at SMTA within the Master Trust shouldn't be impacted. Master Trust 2014 (also seen it referred to as Master Trust A): Here's the interesting portfolio, the Master Trust portfolio is setup as an SPV, its bankruptcy remote from the rest of SMTA, and has a A+ rating by S&P with a 75% LTV. The asset base is very similar to that of the rest of SRC, single tenant triple net leases, albeit a higher concentration of smaller tenants. The effective leverage SMTA will be able to get inside the SPV is about 12x EBITDA. I was able to locate the trustee report and the distributions to SRC have been pretty consistent over the past few years and they haven't stuffed the SPV with bad assets since announcing the spin. 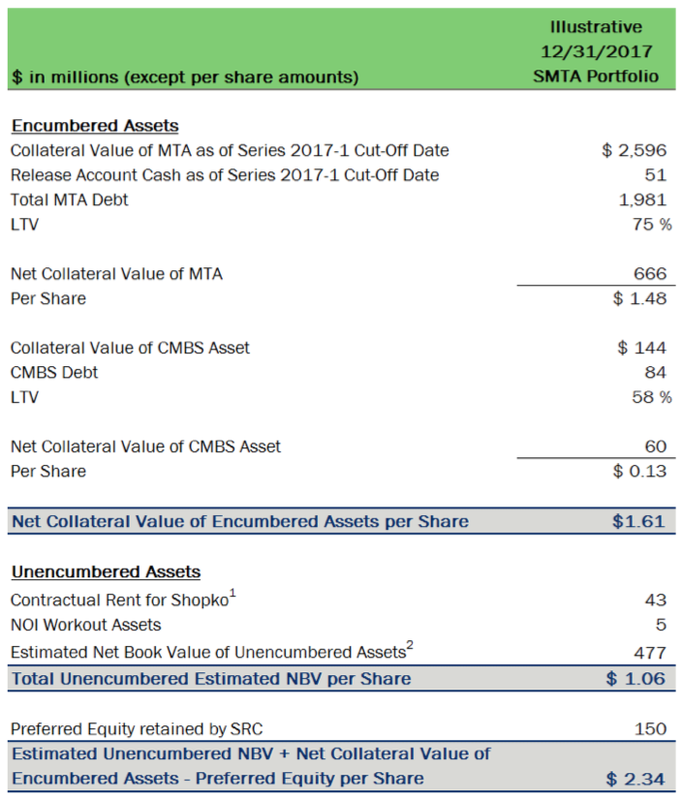 Through the Master Trust and a new CMBS issue, SRC was able to raise an additional $698MM in debt at SMTA that will be used to reinvest in STOR/O/NNN like assets at SRC. SMTA will be externally managed by SRC for an annual fixed fee of $20 million plus a $6 million property management fee. There's additionally a one time incentive fee that triggers in the event of a change of control or the management agreement is terminated without cause after 3.5 years. I think that shows you where management's head is at, if things work out, this entity will be merged away or some other transaction will take place within plus/minus 3.5 years. New-SRC is the critical piece to the overall SOTP, after the spinoff it will be under leveraged compared to peers with a largely similar tenant roster, if it can re-rate to STOR's multiple (not suggesting it happens over night) it's a $9.75 stock ($0.65 * 15) versus an $8.50 price today, and that's a conservative approach since we already know they're going to have a lot of dry powder ($698MM from SMTA that they'll lever 2-1) to start the acquisition engine again, growing AFFO. SMTA won't have any close peers that I'm aware of (please correct me if there is one) and will probably trade terribly initially as the investor base for SMTA will be much different than SRC. SRC provided an NAV build in the presentation today, the $1.61 value in the Master Trust is likely pretty solid (as of January 2018) as its just refinanced and had a third party assess the value of the collateral as part of that process. The Shopko and workout assets are a little trickier, SRC has been able to dispose of some Shopko properties at similar cap rates to what they're showing here, but its unlikely the public REIT market will assign a 9% cap rate to the Shopko leases. Quick and dirty, I'd probably assign a 50% discount to the $2.34 NAV presented here for today's purposes although I like the spinoff for its call option like return potential if their reinvestment plan works given the leverage at the Master Trust. $9.75 for new SRC + $1.17 for SMTA = $10.92 versus a share price of $8.50 today, or ~30% upside without accounting for any new investments either side makes with their growth capital. Why is this so undervalued? I think it mostly relates to the typical net lease investor base, REIT investors like simple and safe stories, this spinoff transaction while creative is far from simple and the headline concentration risk to Shopko has scared away many investors. This spinoff should remove the tenant concentration risk, simplifies the story, and then through the reinvestment of the capital raise from SMTA, allows SRC to return to the market and show a growing AFFO/dividend stream which should also help raise the valuation. Biggest risks here: 1) interest rates moving higher than expected, the majority of their leases do have escalators built in but they're long dated and the investor base is also interest rate sensitive as net lease REITs are viewed as a bond alternative; 2) general recessionary risks, particularly with retail, although SRC is trying to move more towards services based tenants, these are risky borrowers that often can't get traditional financing elsewhere so they turn to a sale-leaseback transaction. In a recent post I mentioned there are some interesting spins on the horizon, one of those is La Quinta Holdings (LQ) doing an OpCo/PropCo split sometime in Q2 2018. Their plans changed a little last week with the announcement that Wyndham Worldwide (WYN) - also doing an interesting spin - is buying La Quinta's asset-lite management company business for $1.71B in cash (after backing out $240MM Wyndham is reserving for potential taxes La Quinta will owe in the spinoff) or roughly 15.1x EBITDA. Since Wyndham is paying cash, it's fairly easy to back into what value the market is assigning to La Quinta's PropCo spinoff, to be named CorePoint Lodging (CPLG). Today, La Quinta's enterprise value is roughly $3.83B and combined company has an estimated $331MM in EBITDA for 2017. Wyndham is paying $1.71B for the management company that will do $113MM in EBITDA, leaving an EV of $2.12B and $218MM in EBITDA behind in the REIT spinoff, for a 9.7x EBITDA multiple. CorePoint is a hotel REIT, I've discussed the disadvantages of those in previous posts, but in summary they're more an operating company/franchisees than true REIT models, they're taking the majority of the business risk rather than acting as a landlord charging rent. La Quinta's model is a mid-market select service hotel, historically they've been concentrated in the south (particularly Texas) but have expanded and diversified in recent years after being hit hard in the oil downturn. Their hotels typically tend to be situated in suburban, airport and interstate locations that might be less susceptible to AirBnB but more at risk for overbuilding/supply risk. If CorePoint is worth 12x EBITDA, my math gets me to about a $14/share price for the spinoff (might move around a little depending on the eventual net debt on the spin) + $8.40/share from Wyndham for the management business for a total of $22.40 versus a $19.60 stock price today, or about 14% upside. No one is going to get rich on this idea, if you could isolate the spinoff directly it'd be a better deal, but I like the risk/reward. Two other points to consider: 1) the $240MM WYN is reserving for taxes approximates a $2.85B EV valuation or 13x EBITDA for CorePoint (21% on the difference between the first day of trading and the book value of the assets); 2) since CorePoint is a taxable spinoff (REIT spins are no longer allowed to be tax free) it will be immediately be available to get acquired, and I expect it won't be a standalone company for very long.